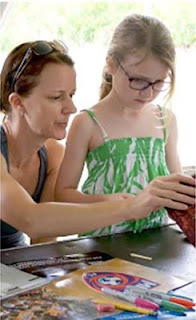 While you're out and about getting inspired by all the art at this year's Coconut Grove Arts Festival, stop by the Art Box tent in the Family Zone in Regatta Park, to create some art of your own. They will be offering complimentary workshops for adults and families every day. A 360° still life will provide participants a visually compelling reference to draw from and develop their skills with the help of our instructors. Each participant will be guided throughout this process, from sketch to finalized drawing, all while learning about composition, gestures, contours, and shading. Using the natural world as inspiration participants will work with clay to mold sculptures that will appear as if nature had created them. These new forms will borrow the textures, proportions, and patterns found in the natural world while being unique in their composition. Participants will learn about principles and elements of design as they apply to three-dimensional work. Unlike other forms of printmaking Monoprinting is a process which creates unique impressions, where no two prints are alike. Monoprints are painterly images full of spontaneity and dynamism. Reference materials will be provided to inspire participants to create their compositions.